Are you one of the many people who have always wanted to be able to draw? 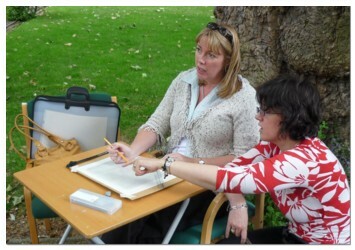 Or perhaps you can draw but would you like to develop your skills and confidence? If your drawing skills need improving there is no better way to do this than with a 5-day Drawing on the Right Side of the Brain workshop. Registration is now open for 2016 courses in the UK, so if you are interested please do get in touch so you won't be disappointed. "My opinion of the teacher, the course and the organisation is very positive. It has provided me with insights about myself which have greatly benefited me and go beyond a drawing course." Kneadable or putty eraser A versatile eraser that can be moulded into different shapes. Dab it, stroke it, rub it to get a wide range of textures and makes. Great for softening transitions. As they get dirty you can clean them by stretching and folding into itself although at a certain point they do get hard - but skill keep them as just as useful! White plastic eraser Good for clearing large areas. Can cut into 'wedges' to get narrow points for getting into those tricky areas. Eraser pencils These come in all shapes and sizes but useful for small areas but also for ‘drawing’ with. I always have a clutch of erasers in my drawing kit. It’s worth spending some time playing with them and experimenting with creating different marks and textures and then introduce these into your drawings to create interest. For practical reasons I keep a separate set of erasers for drawing with graphite and charcoal.